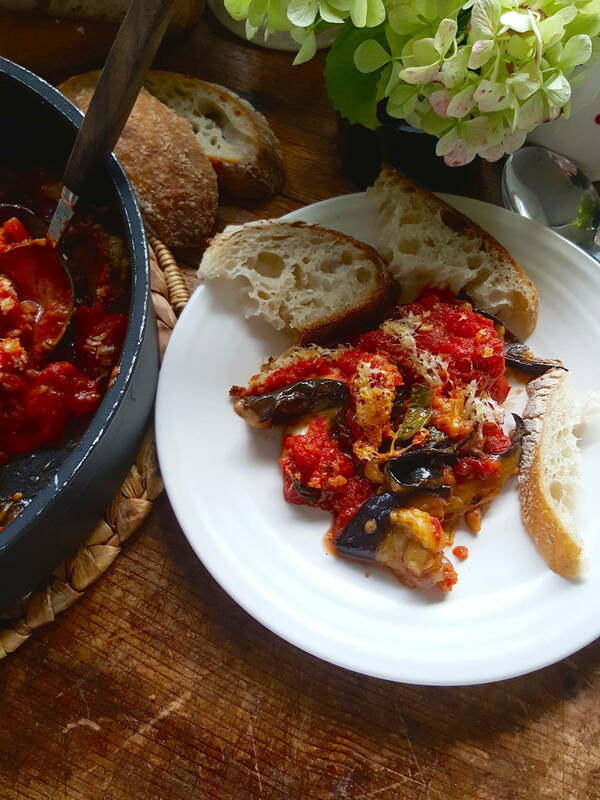 The components for this dish (sauce, eggplants and peppers) can be prepared in advance, making it easy to assemble, or assemble the entire dish a day before baking (keep it refrigerated but bring to room temperature before baking). 1 Put 2 tablespoons of olive oil in a saucepan with the garlic. Cook gently until garlic turns golden. Add tomatoes, salt, sugar if using and black pepper. Bring to a gentle boil, then lower the heat and cook for about 30 minutes, until pulpy. 2 Cut eggplants lengthways into long thin slices. Brush with a little oil and cook on a barbecue grill rack heated to medium. 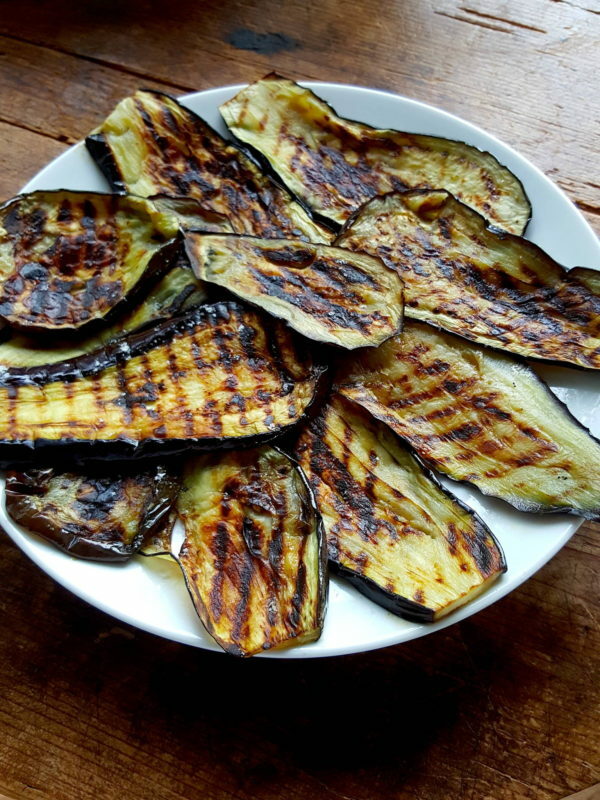 Cook quickly until tender and golden and lightly charred around the edges; you’ll need to move the slices around often as they cook to prevent scorching, Transfer eggplant slices to a plate as they are done and season with sea salt. Repeat with remaining slices. Alternatively, cook eggplant slices in a ridged grill pan heated to medium-high. 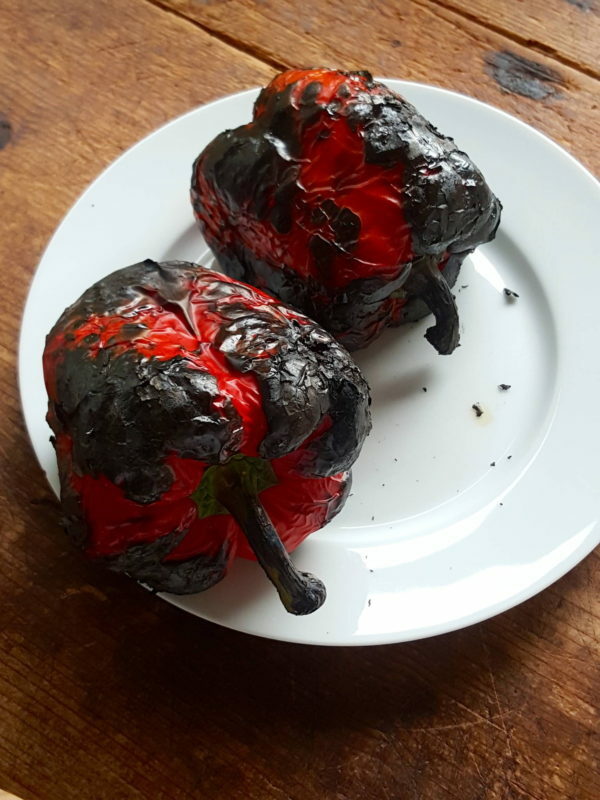 3 Cook peppers directly over a gas flame until blackened, turning them with tongs (put them right in the flames). Alternatively, cook them in the flames of a barbecue, or on the rack in an oven preheated to 220°C (425°F), turning them as they blacken (they’ll take around 20 minutes). When all the outer skin is charred, transfer to a plate and leave until cool, draped with paper towels. Peel off blackened skins, rinsing fingers, but not the peppers, or you’ll wash off gorgeous flavour. Cut peppers in half, remove cores and seeds and cut flesh into strips, then cut strips in half. 4 Put a layer of eggplant in a shallowish ovenproof dish (approx. 2 litre/8 cup). Scatter over some red pepper and put on a few blobs of sauce (use about half the sauce in layering, reserving half for the top of the dish), a scattering of parmesan (likewise with the parmesan, use half in layering, and save half for the top), a smattering of crumbs and a few basil leaves, a few pinches of salt and a little grind of pepper, and a portion of the mozzarella. Repeat the layers until everything is used up, finishing with a good covering of sauce. Scatter over remaining parmesan. 5 Have the oven preheated to 200°C (400°F). Bake gratin for 30 minutes, until bubbling and golden on top. This is a stunning dish. 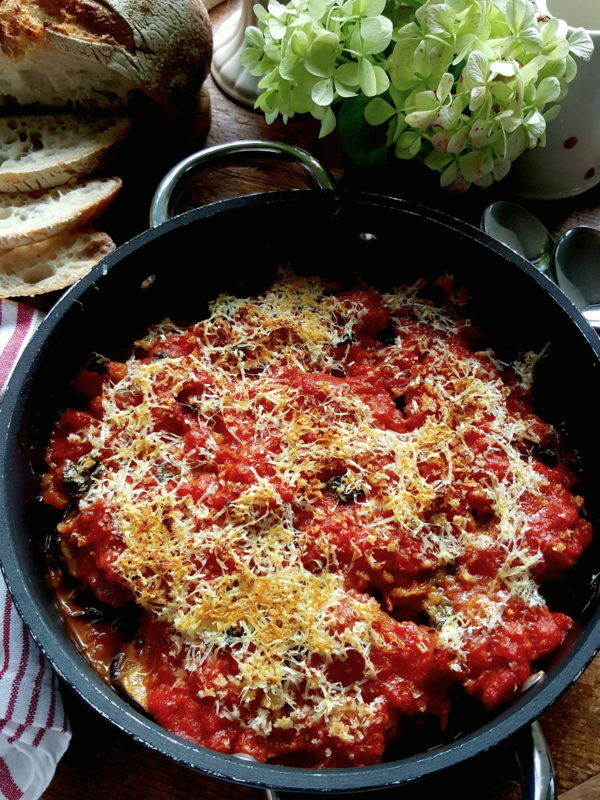 It can be served hot, while the mozzarella is melting and stretchy, or at room temperature (the cheese will still be supple but not stretchy); leftovers, should there be any, reheat well in a microwave; it makes a fabulous centerpiece for a vegetarian meal; and, finally, it tastes delicious. Artisan food products – quality ingredients made with care and a big nod to the environment.